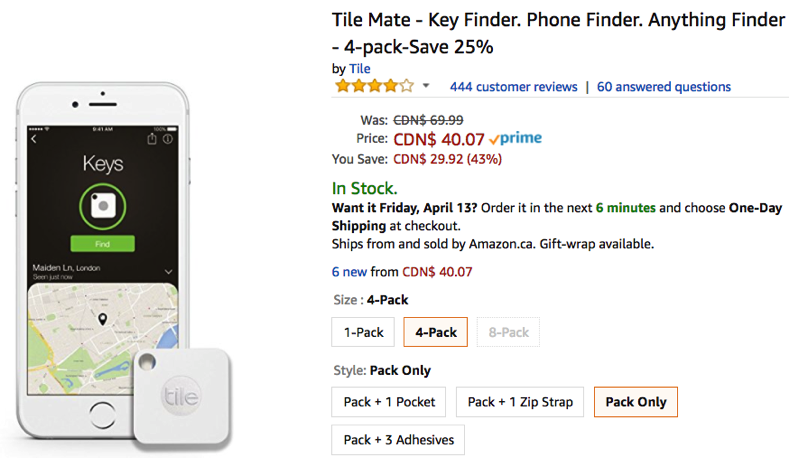 Tile Mate has a sale on their 4-pack on Amazon.ca right now, showing a 25% off discount, taking the price down to $40.07, the lowest price ever on the site according to price tracker CamelCamelCamel, saving you about $30. The Tile Mate is 25% smaller than its original design, water resistant to IP57 standards and includes a key ring so you can attach it to anything, such as your house keys, back pack, suit case and more. If you’re the type of person prone to losing stuff, Tile Mate trackers probably are for you. You can manage them with the Tile app available for iPhone, iPad and Apple Watch. Click here to jump on the Tile Mate 4-pack while the sale is still available.